This thoughtful and comprehensive definition of the vary subject that brought together students, academics, health and allied-health workers, government and non-government organizations and the private sector, came alive throughout the course of the 21st annual Canadian Conference on Global Health, in Ottawa (Nov 1-4, 2014). A Student and Young Professional Summit was hosted leading up to the main event, creating a space for the fledgling leaders in global health to engage those who have gone before them, speaking on the incredible opportunities and challenges of working in global health, perspectives from the field, and practical information for launching a career in global health – irrespective of degrees. The event also featured a simulated humanitarian aid intervention as the result of a natural disaster in a politically complex situation. Students were assigned roles as key players and allowed time to create a ‘game-plan’ to tackle the existing humanitarian issue within the challenging socio-political context. The combination of inspirational speakers and engaging activities created a comfortable environment for students from different disciplines to connect and inquire about each other’s pasts and hopes for the future, while at the same time empowering those of us in the early stages of our global health trajectory to have the confidence to engage our global health heroes in conversations, both during the SYP summit and the larger CCGH. To read part 2 in this series please click here. Some of my favorite learning experiences, whether inside or outside the classroom, have been those lead by passionate individuals. When someone loves their work, it reads in their face, in the way they lecture, and in their willingness to share their experiences and mentor others. This is why I would like to invite you to join me in attending Global Health Rounds, on the 3rd Wednesday of each month, held by your very own Global Health Office. 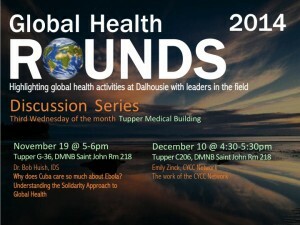 Each of these sessions highlights a different global health activity at Dalhousie or a contemporary global health challenge through presentations and talks by leaders in the field. The rounds are a forum for discussion, questions, and interaction. Each has left me with more than just increased knowledge on the topic at hand. The intimate setting has given me an opportunity to meet like-minded people, network, and pursue different opportunities. So far, two sessions have been held. The first, was on social accountability within medical schools and was led by Ms. Shawna O’Hearn, Director of the Global Health Office, and Dr. Jeff Kirby at the Department of Bioethics. The second, lead by Dr. Des Leddin at the Faculty of Medicine, was titled “Health Education; Can the Net Level the Playing Field?”. He spoke of international partnerships in the establishment of specialty care centres in other countries. The facets of global health explored by these leaders are relevant to health professionals, researchers, and the public alike. As an emerging health care administrator, my own values and understanding have been tested through these rounds when I learned the value of establishing specialty facilities in developing countries, even when some of the most basic health care needs still have to be met. I have to say, I felt as though I was being exposed to “inside information” throughout these discussions, candid and unpublished truths from the mouths of the experts themselves. 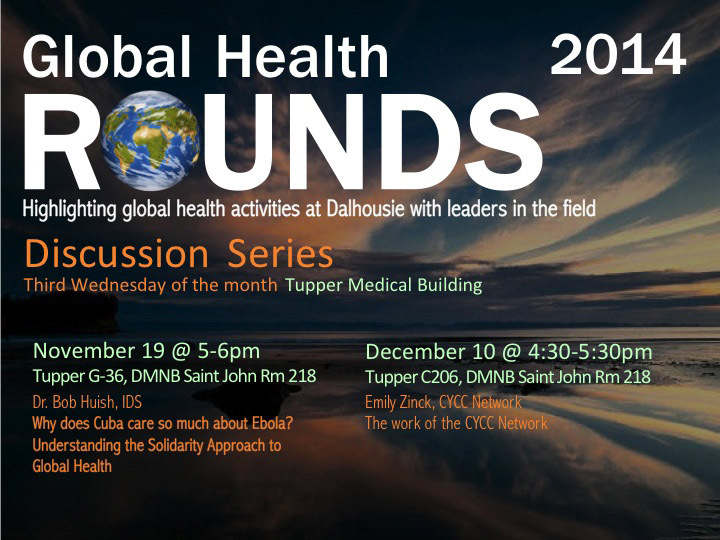 The next upcoming Global Health Round is with Bob Huish, Assistant Professor, Department of International Development Studies. He will explore the topic of “Why does Cuba care so much about Ebola? Understanding the Solidarity Approach to Global Health”. I hope to see you all there! November 19, 2014 @ 5-6pm Tupper G-36, DMNB Saint John Rm 218. We want to give a warm welcome to our new volunteers from Canada World Youth (CWY)! Oksana and Priscilla arrived in the city of Halifax on September 18th, 2014. 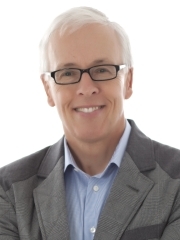 They have been busy getting to know Dalhousie and the city of Halifax ever since. It’s a great opportunity for Dalhousie to host such inspiring individuals, eager to learn and volunteer their time! In fact, they won’t only be learning from the great initiatives at Dalhousie, they will also be sharing their experiences with our community. CWY is a program founded in 1971 that offers international volunteer programs to youth from Canada and abroad. Through participation in community-driven development projects, these youth acquire the leadership skills to become agents of change. Youth are between the ages of 18 and 25 years and are paired with a counterpart from another country. All participants are living with host families during their stay in Halifax and will be spending the second part of their time with CWY abroad. Oksana and Priscilla have been spending most of their time with the Global Health Office and so far have worked on helping to support the recruitment of high school graduates into the health professions at Dalhousie. They have also worked with Dalhousie’s Health Promotion group and supported events during mental health week. Hello everyone! My name is Oksana. I was born and raised in Vancouver, BC, and am currently in Halifax for the next 3 months. I am so excited to be on the east coast and am hoping to try some lobster sometime soon. I was interested in volunteering at the Global Health Office because I find it interesting to look at health issues beyond geographic borders. I think it’s important to help decrease health inequities around the world, regardless of race, culture, gender or social class. As part of my experience with CWY, I am excited to learn more about new cultures. I am also hoping to learn more about myself and become a more independent individual. Priscilla is my name. I come from Tema, in Ghana, which is in the Western part of Africa. It’s been exciting being a volunteer for CWY. I hope to learn the distinct culture of people living in Halifax. Volunteering with the Global Health Office has been a step to help me realise what I really want to pursue since I have an interest in health. I hope to learn more about health and possible careers in order to create a platform to educate my home country more about their health and well-being. My stay here so far in Halifax has been fun and I’m looking forward to visiting new places around the city. Be sure to offer our students a warm welcome if you see them! They will be with us for a total of three months, dedicating their time to various health related initiatives on campus and in the community.